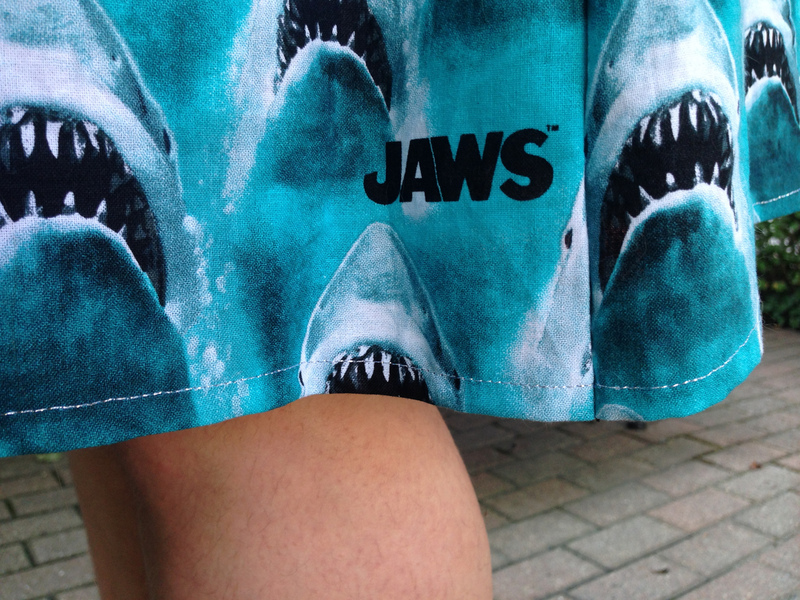 I saw this teal Jaws fabric at Joann’s and fell in love immediately. I bought three yards, intending to make myself a matching short and shirt set. Clearly, I did not end up with shorts or a shirt. 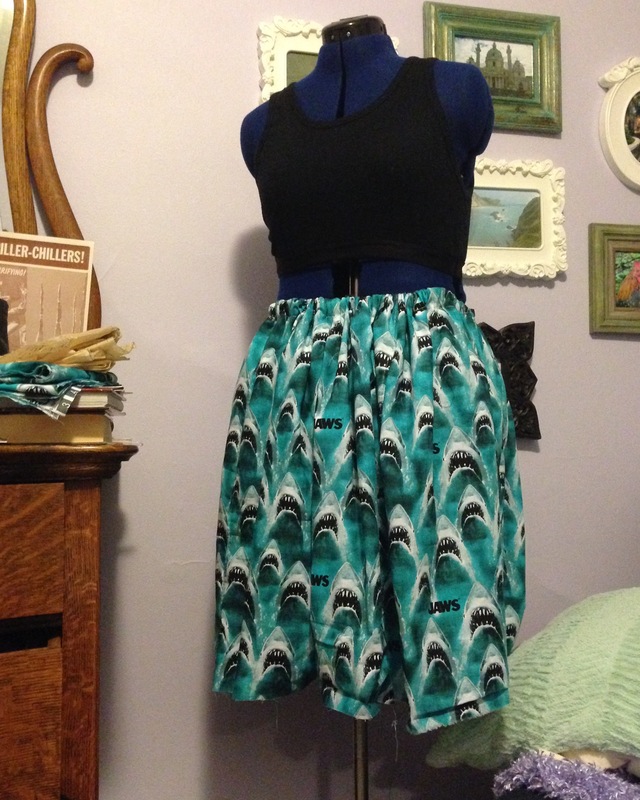 Initially, I used about two yards of the fabric to attempt to make a pair of shorts that looked like a skirt, similar to short culottes but with a gathered waist. This is how the shorts looked around my second attempt. The looked fine on the mannequin, but when I put them on there was a weird triangular gap in the lower center front and back. Not only that, but when I sat down, they pulled in weird places and were uncomfortable to sit in. I left the shorts alone for about a week, trying to figure out what to make from them. Eventually, I just cut the shorts into 6 large isosceles trapezoids. 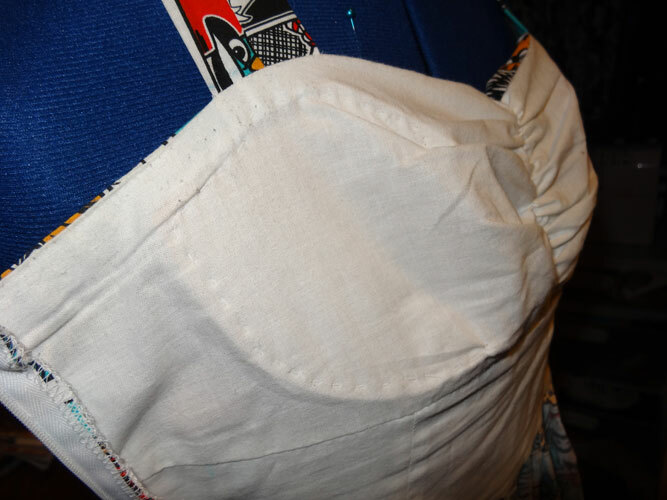 I sewed the sides of the trapezoids together, leaving one side open, and gathered the top into a waistband. On the side that was still open, I sewed in an invisible zipper and two hooks and eyes. I then folded over the waistband and top stitched across the bottom with a silver glittery thread. I had already hemmed the shorts with the glittery silver fabric, so I just made sure to line up the bottoms of the pieces carefully so I wouldn’t have to sew another hem. 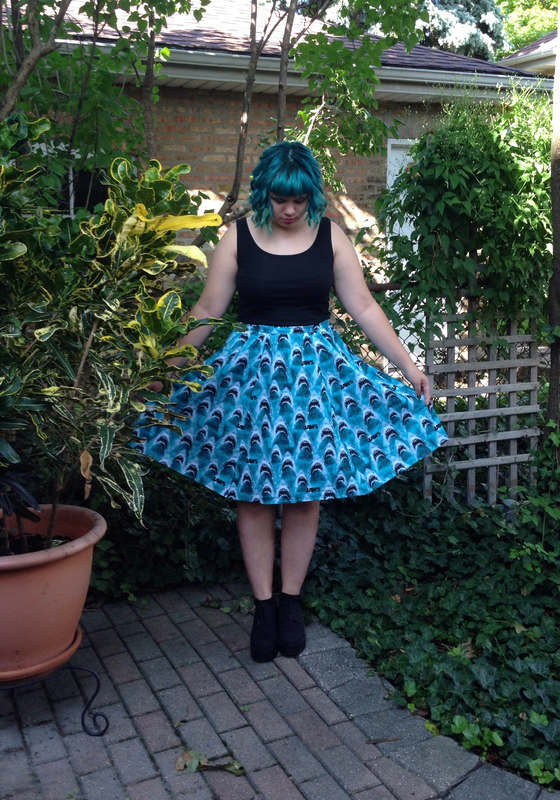 After I finished the skirt, I did not have enough fabric left to make myself a matching shirt. 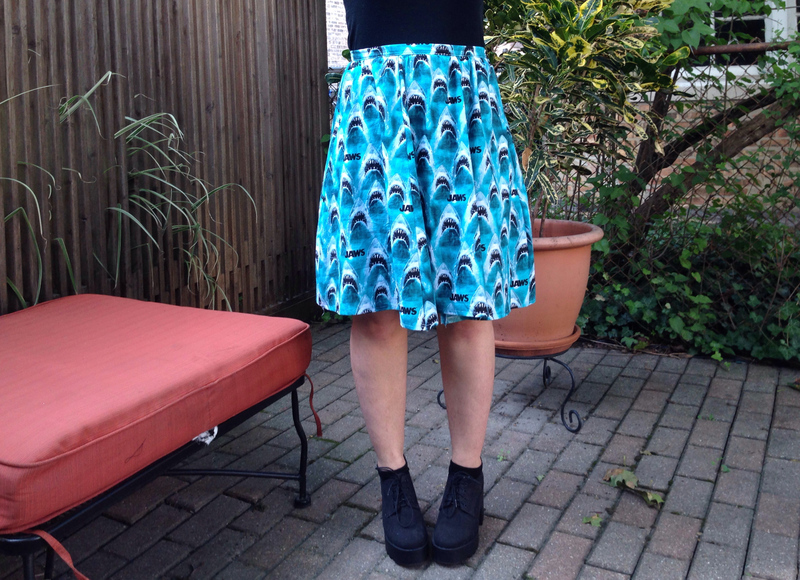 There might be enough left to make my little sister a skirt, so there may be another Jaws Skirt post in the future! 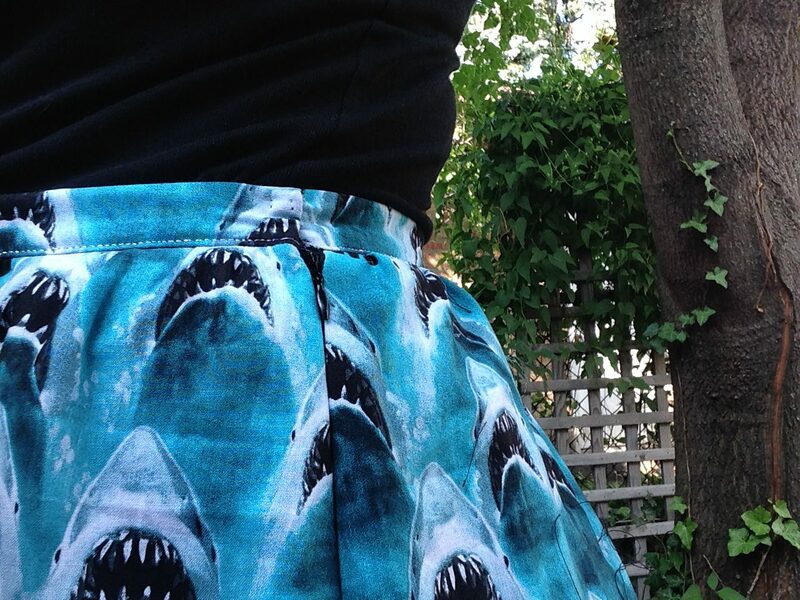 I really like how this skirt turned out and have already worn it twice. I will definitely be wearing this a lot more! 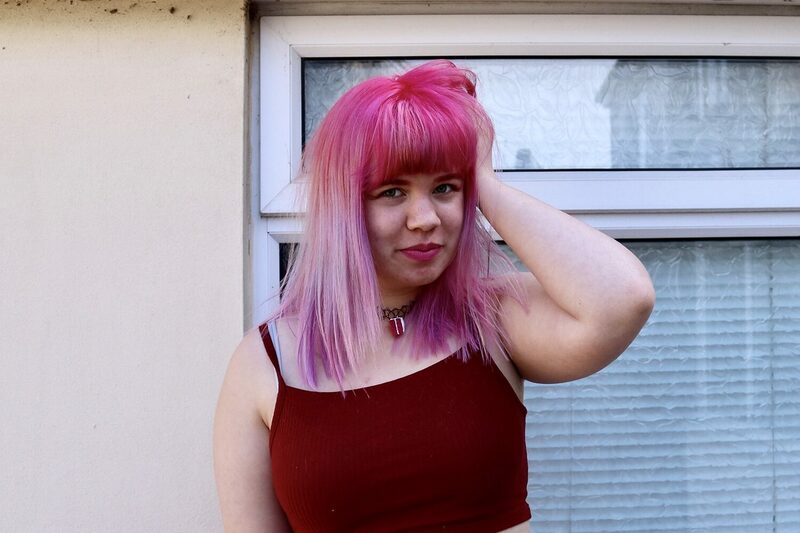 This pictures were taken in September…Oops. 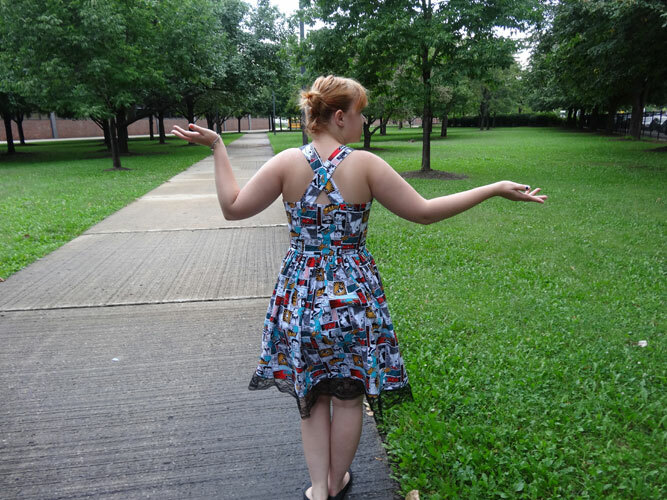 The dress is another pattern from Gertie’s New Book for Better Sewing. It’s the Sweetheart Sundress, although I modified it to better fit the idea that I had in my head. 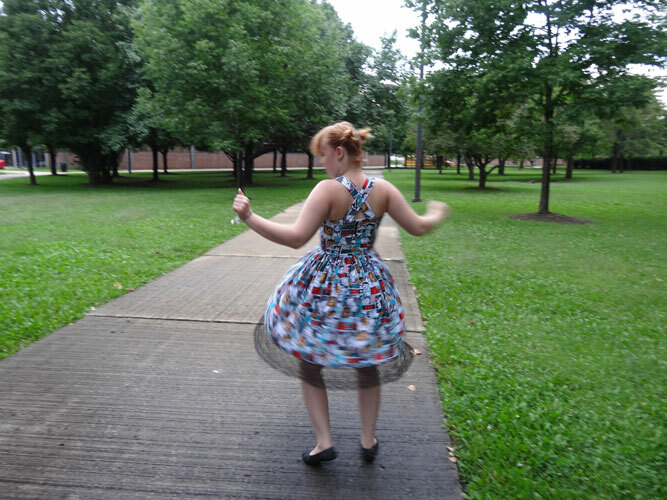 I changed the front of the dress so that it is no longer just two pieces (one on each side), but is now five (two on top, three on bottom), changed the back piece by separating the piece along the darts into three separate pieces, and changed the side zipper in order to make a more fitted dress. The skirt is a simple gathered skirt with a wide lace trim to add a bit of interest to the dress. The first time I applied the lace to the dress, I accidentally melted a segment of the lace with the iron and had to tear out the whole trim and replace it with new lace. This is the inside of the dress. Only the top is lined, and I hand sewed in bra cups for support. The zipper is on the left side, and I did not encase it in fabric on both sides because I was trying to avoid hand sewing as much as possible. I think I like the new lace much better. 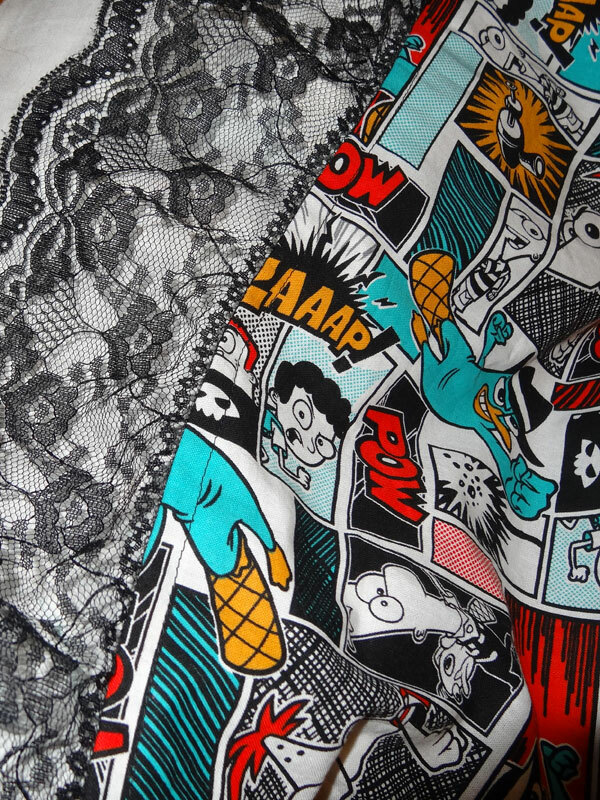 I found this fabric at Joann’s while looking for a fabric I could use to make a comic book print dress. 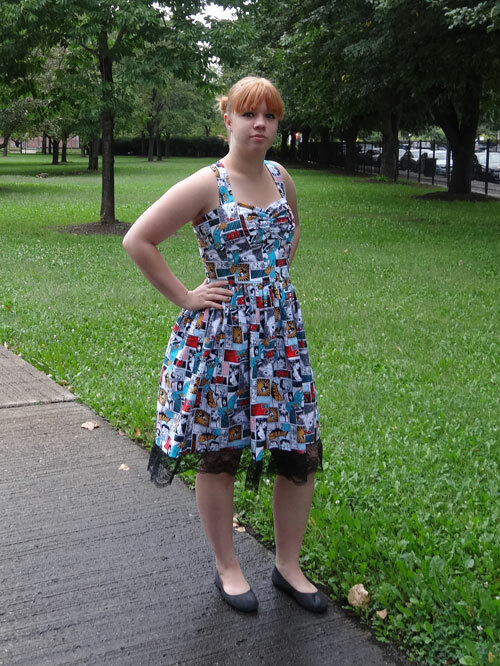 I think that the fabric fits the criteria I set, because it includes animated characters in a comic book print design. It’s a cotton blend printed with the Phineas and Ferb characters with a focus on Perry the Platypus.